The plaque commemorates those who served with the 2nd / 33rd Infantry Battalion during World War Two. A smaller plaque is erected in memory of Lieutenant -Colonel Cotton who was Commanding Officer of the battalion from 1943-1945. The Battalion was formed as part of the Second Australian Imperial Force in the United Kingdom on 27 June 1940 as the 72nd Battalion to create the 25th Brigade. The battalion’s personnel were drawn from throughout the Australian force that had arrived in Britain earlier in the month and manpower shortages meant the battalion included only three rifle companies instead of the usual four. The battalion was deployed in 1942 to Papua to reinforce the battered Australian units on the Kokoda Trail.The battalion took part in the invasion of Syria and Lebanon, the Kokoda Track campaign, Salamaua–Lae campaign, Ramu Valley–Finisterre Range campaign and lastly the Borneo campaign. 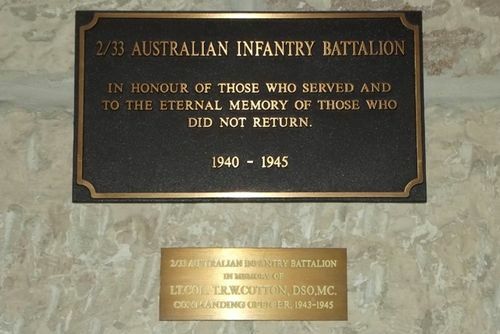 The battalion was disbanded at Brisbane, Australia on the 12 March 1946.